You’ve probably heard the talk of AT&T throttling heavy data users, but now we can see it’s effects ourselves and it’s probably worse than you thought. AppAdviceDaily put together the video up top, skip in about a minute ahead and you’ll see a side-by-side comparison of download speeds on a throttled vs non-throttled iPhone 4S. The speed difference is gigantic, as low as 0.07mbps on the throttled account vs 1.8mbps on the normal account. The threshold for being throttled is alleged to vary widely, with some reports saying it’s as low as 1GB and others suggesting it’s over 4GB. Once you’re throttled, you’re basically kicked off the 3G network and stuck on the painfully sluggish 2G EDGE network. If you’re concerned about this, check data use on AT&T and Verizon by logging into your account. For those close to their allotted data limit, it may be a good idea to disable data or at least turn off 3G until the next billing cycle. It’s a good thing we’re paying $130+ a month for this service we can’t fully utilize. Here in Bulgaria I pay 10$ for 256MB on fastest speed – over 650KB/s download speed and after those 256MB are over, I get 128KB/s unlimited traffic. And this is the lowest plan, there is other option, for 35$ you get 2GB for fast 3G, over 5mbps.. I URGE EVERYBODY TO FILE A COMPLAINT WITH THE FCC. THEY WILL EXAMINE IF THERE IS A POLICY VIOLATION ON UNLIMITED PLANS REGARDING BANDWIDTH THROTTLING. EVERY COMPLAINT HAS TO BE ANSWERED IN WRITING BY AT&T IN WRITING WITHIN 45 DAYS. PHONE 1-888-CALL-FCC (1-8888-225-5322). You can use an online form on the FCC site too, probably easier than calling. I would not have committed to a new phone with them and extended my contract if I knew they were going to do this. When you visit the above web site it directs you to buy extra gigs of data at $10.00 per gig. As long as you are paying for it, there is no problem with congestion. IT’S ALL A BIG SCAM. THEY SHOULD GET SUED FOR BRIDGE OF CONTRACT. everybody should use as much data as possible to teach them that we are not giving up in this fight. Stream anything live as you sleep to really show them what data congestion is all about. We need more people to complain to AT&T and the FCC. 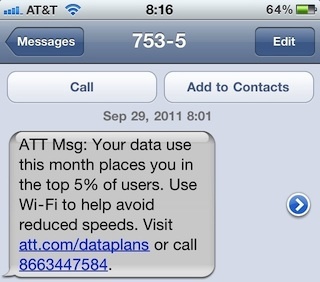 This policy is uncalled for, as is the extent to which AT&T is throttling the data speeds. If they did not wish people to use their network, they should not have grandfathered people in with unlimited data plans. Im filing my complaint with the FCC. This is an excellent demo, and EXACTLY what I experienced here in Dallas from 2/3 to 2/9. In fact, the demo is being way too generous in showing one of the throttled/choked speeds spiking to 0.44Mbps. My speeds were almost rock solid at 0.12Mbps regardless of time or location. Yet AT&T reps claim your data throttling is determined by the network needs for that place and time. BS!